Fitness is trending. From #fitlife to the variety of new fitness concepts and apps, there are certainly plenty of fitness trends you can give a go in 2018. Did you know that there are 8,000 fitness apps? And the most trending fitness routines of 2017 were wearable tech, body weight training, and High-Intensity Interval Training (HIIT). What does 2018 hold for fitness? First Talk to a Doctor! The most important part of beginning any new fitness routine is to make sure you are healthy enough to do said routine. How? 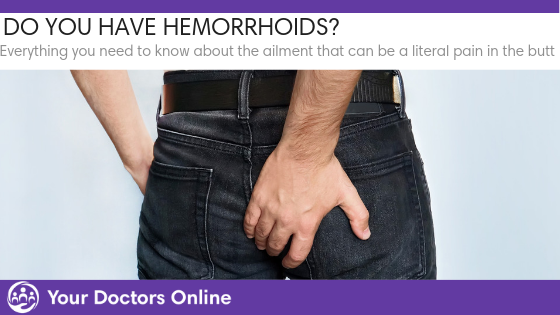 Check with a doctor to discuss your health, past injuries, and any potential issues you may experience. For instance, not everyone can hop into a CrossFit box and start deadlifting 200 pounds. A doctor and your CrossFit coach will be sure to tell you this. So be sure to talk to the professionals first. 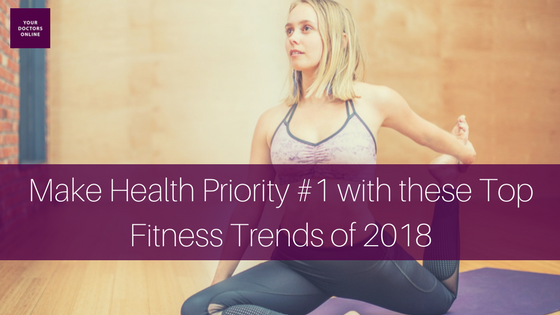 However, once you are deemed ready for new fitness trends, it is time to make health and wellness a priority in 2018. Here are a few fitness trends that may be just right for you this year. High-Intensity Interval Training (HIIT) was the third most popular fitness trend in 2017. And it will most likely be one of the most popular in 2018. HIIT is short alternating bursts of intense exercise with very short periods of recovery. What makes HIIT so popular? It is efficient. Each workout can be done in just 30 minutes and make you feel like you just did two hours. It also can be free of equipment, which is enticing for those who don’t want to pay over $100 for a gym membership. Some people just like to have a little encouragement, making group exercise classes or meet ups a top fitness trend for 2018. Normally, fitness groups involve more than five people and far less intimidating than one-on-one with a trainer. This may be why CrossFit has been so popular among every age group across the world. One great fitness trend that is group-minded is F45 Training. It is all about motivation, innovation, and results. And it can be done in just 45 minutes. 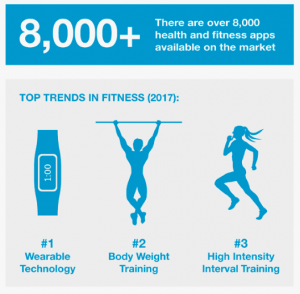 Wearable smart devices, like smartwatches were a huge fitness trend in 2017. This is likely to continue in 2018 with more health tech making waves for health-minded enthusiasts. “Whether it’s smartwatches, fitness trackers or even apparel, the tech you can wear to keep tabs on your fitness levels is more popular than ever,” Lee Bell of Forbes said. Wearable fitness tech allows you to learn more about how you are exercising, like tracking distance, calories burned, heart rate, duration, and a whole lot more. They can even be used for tracking sleep and activity detection. This was the second most popular fitness trend last year. Anything that requires bodyweight only seems to be a hit among exercise enthusiasts, from beginners to YouTube fitness stars. Bodyweight exercises include, pull-ups, push-ups, air squats, burpees, mountain climbers, lunges, and more. No equipment means free and you can do bodyweight training anywhere and at anytime. Building those muscles with bodyweight only can help prevent injury and increase your metabolism too. You will see improvements in your core, quads, glutes, and other major muscle groups. Yoga continues to be a fitness trend of choice for people of all ages and fitness level. Combined with meditation and you have an exercise that is great for your body and mind. By focusing on slow, still movements and your breathing, you can achieve a number of health and wellness benefits. Yoga and meditation has been found to fight anxiety and depression. What Fitness Trends Will You Try in 2018? Fitness trends are always changing. The most important aspect is to make sure you find an exercise routine that is good for you. And don’t forget to talk to a doctor before trying anything new when it comes to fitness. Want some medical advice before trying out a new exercise routine? Our doctors are available 24/7 via our free online Dr. Chat. You can even get 3 months of free healthcare, no questions asked. Simply click the button below to get started.